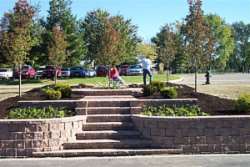 Hardscapes – Bockelman's Landscaping and Garden Center, Inc.
Hardscaping serves to compliment your landscaping, that is the trees, shrubs, and flowers that provide natural beauty. Hardscapes are an ideal way to expand your home’s living area outdoors by adding non-living materials into a landscape, such as wood, stone, metal, and concrete. Regardless, each hardscape feature adds beauty, style and value to your landscape.